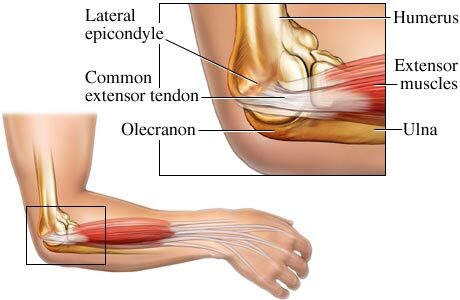 Pain on the outside of the elbow which is referred to as lateral epicondylitis can be disabling. Typically seen in 30-60 year olds, patients complain of point tenderness over the outside aspect of the elbow ( lateral epicondyle) aggravated by gripping and activities that extend the wrist. The pain is thought to arise from degenerative changes in the muscles that attach to lateral epicondyle called the extensor muscles. These muscles allow the arm to extend(bent backward) . The diagnosis is made by clinical signs and symptoms. A common diagnostic test is the Cozen test. Conservative treatment includes PT, NSAIDs, heat, ice and rest. Injection of cortisone has been demonstrated to be no different than placebo. Complications from repeated steroid injections include fat atrophy and potential weaking of the tendon. Not all lateral elbow pain is lateral epicondylitis. LF presented with a 5 month history of lateral elbow pain after tripping over her dog and striking her elbow on her granite countertop. Conservative therapy had failed and her physician had referred her for PRP injection. At the Centeno-Schultz Clinic therapeutic injections are performed with either x-ray or ultrasound to confirm accurate placement. LF’s ultrasound exam was significant for tendosis (tendosis) of the extensor muscles which are commonly associated with lateral epicondylitis. More important was the significant tendosis and partial muscle tear of the triceps muscle (not typically seen with lateral epiconduylitis). Identifying this second site of injury was cardinal as it represented another source of pain which needed to be treated for maximal clinical outcome. At the Centeno-Schultz Clinic an accurate diagnosis and appropriate placement of regenerative therapies whether it be stem cell therapy, prolotherapy, APC or PRP injections is our standard.